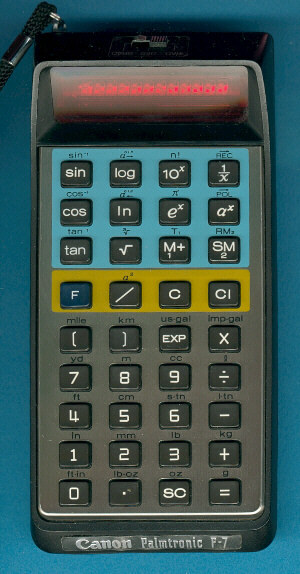 Size: 7.0" x 3.4" x 1.8"
The Palmtronic F-7 was introduced shortly after the Texas Instruments SR-50 and uses a very similar calculator architecture developed by Hitachi. Instead the single-chip calculator chips found inside the F-5 and F-6 models, it uses a processing chip (CPU) HD3650 surrounded by a Read Only Memory (ROM) HD3651, a T-CHIP (Timing Chip) HD3653 and the HD3666 labelled PUC. The same CPU was used in the desktop sized Canola F-11 and the metric conversion calculator FC-80. Once again Texas Instruments demonstrated its capabilities in calculating algorithm. The Canon F-7 looks great but lacks precision. We found similar poor performance with the F-5 and F-2. On the other hand takes the calculation of 69! (1*2*3...*69) with the F-7 only a fraction of time compared to the SR-50. It is easy to understand, with similar calculating performance engineers have to balance between speed and accuracy. Read more about the successful TMC0501 family introduced by Texas Instruments with the SR-50 and expanded till the TI-59. Don't miss the first TI-less calculator sold by Canon, the LE-80M. © Joerg Woerner, July 2, 2002. No reprints without written permission.